Option#3: 8 port pluggable connectors turned on a right angle to make them a little straighter and added blown fuse indicator SMD LEDS. This one would come in at $14. Please comment below and let me know what you would like to see for the next run. I purchased some of these boards during the first group buy, and found them to be perfectly adequate. 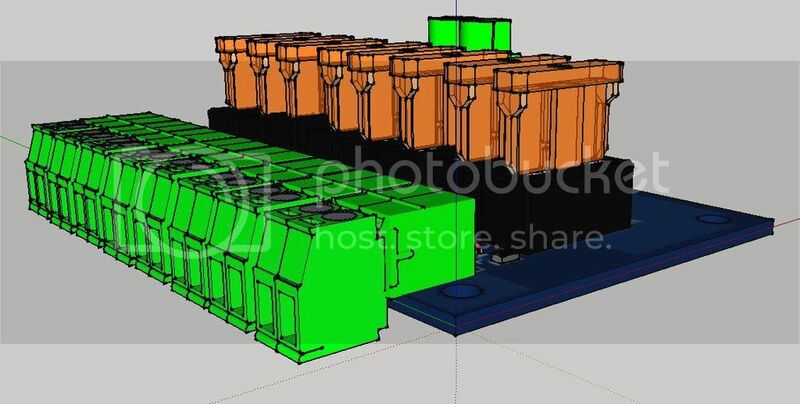 If any changes are made to them, I would like to see them just a bit bigger, with a larger wire gauge output connector if available. Just curious why folks would request a plug-in connector? The connector would likely have to be removed from the cable in the event of having to remove the cable from the enclosure, so why put one on? It was an item that was brought up for discussion a while back on one of the Christmas light confrence calls. It certainly doesn't need them and that is why I wanted the communities feedback before I ran anything. No sense in me designing something that everyone is just stuck with. Would rather have everyones input on design choices first. Thanks for the feedback rstehle! I like the originals and plan to buy more of them if they are offered, I dont see a need in my setup for many 8 port boards, if any. Voltmeter, neat idea, but not needed in my opinion. Same for the blown fuse indicators, I can see a need/want for those more than the voltmeter but as long as you buy fuses that are easy to see through then no big deal. 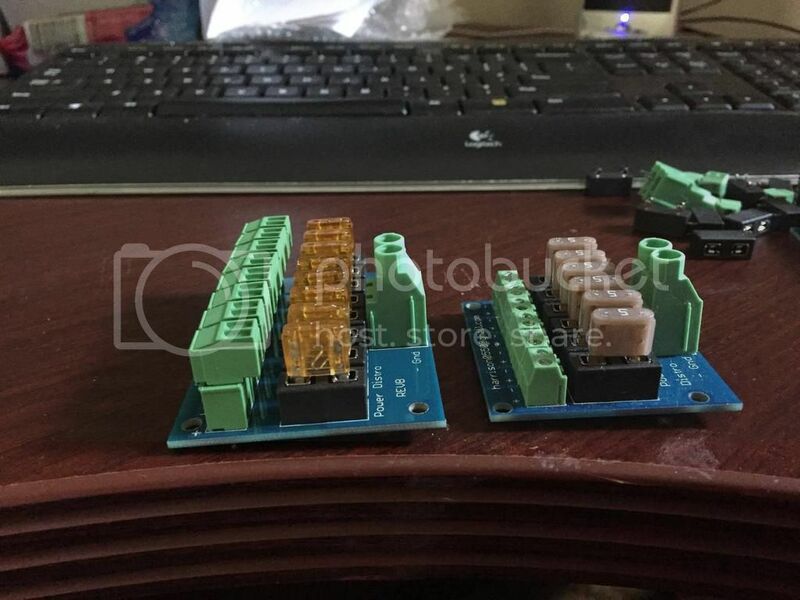 The only suggestion I remember seeing about the originals was putting the holes for the outputs closer together so that the connectors could be snapped together and installed as one piece before soldering, obviously this only helps those that buy in kit form. In the end, id be in for more of the originals, but at only a $2 difference then I can see the point in doing 8 port. I would prefer option #2 even though the vertical plugs may not be aligned but that is much prefered over having the plugs being horizontal and Having to raise the board in order for them to be installed. I purchased 10 of the first run boards myself and like them. 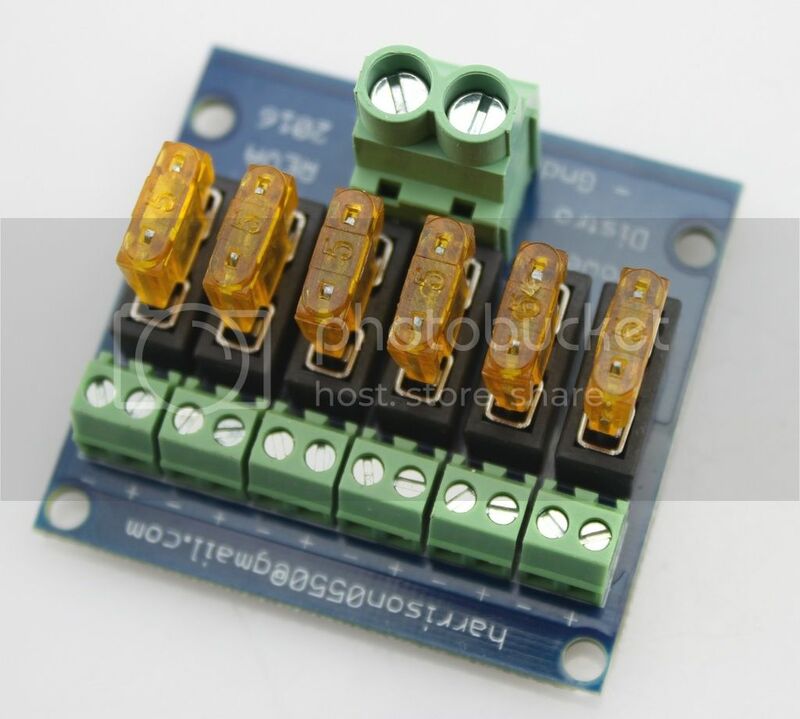 If you make the boards with 8 outputs rather than 6, are you "de-rating" the outputs to 4 amps each? 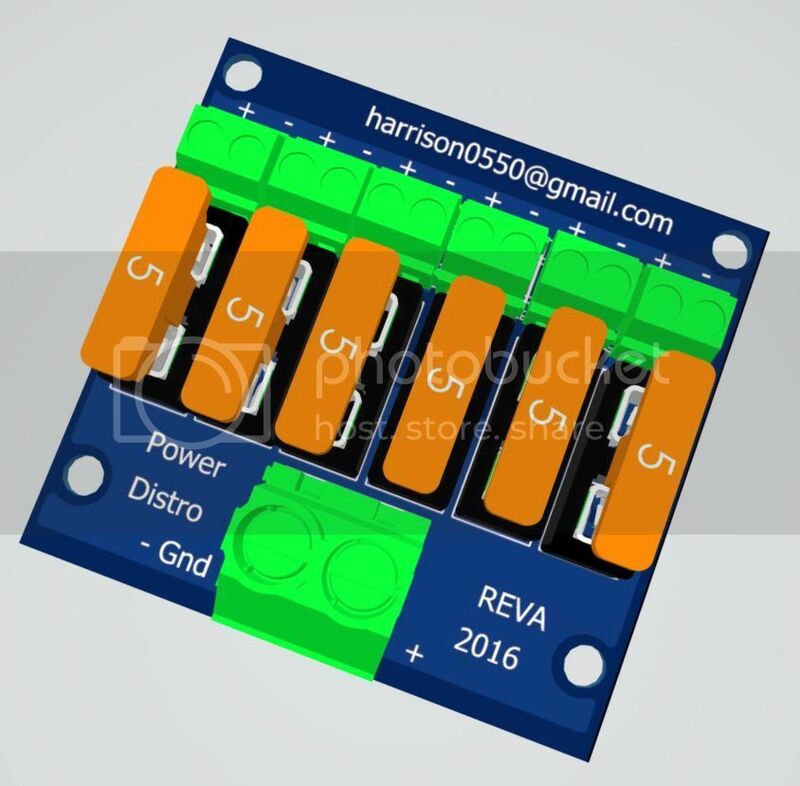 Or will you allow a higher input amperage on the 8 output boards? About the only thing that I would like is the blown fuse indicator on the original 6 output board design personally. I can't see a reason for the voltmeter nor the pluggable connectors for the outputs although as rstehle noted, the ability to use a larger gauge wire in the output connector would be a "nice" feature. 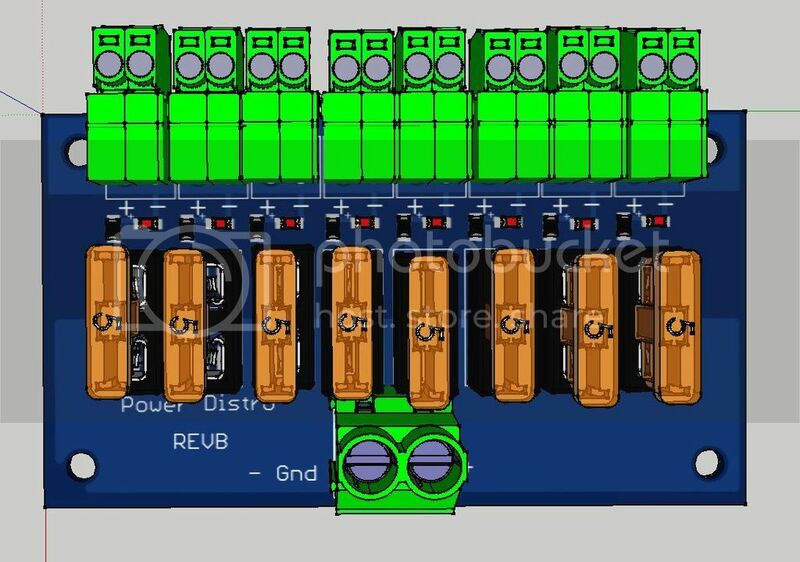 I also think that 6 outputs is plenty for a board this size but slightly bigger would make connecting easier. Agreed! Yes it would be de-rating the outputs to less than 5 amps each. I looked for an input connector that was rated at 40+ amps and they are way to big and cost way to much for what we need. It looks like between here and Facebook posts the original design is reining supreme. I will look tonight at what output connector options are available with slightly larger AWG output. I think the first 6 output original is sufficient. I believe led indicators for blown fuses would be nice. Plug-able could also be handy with or without voltage indicator, but not critical. I'd be in for 10 pcs to start. Rather than a voltmeter, an amp meter would probably be more suited for this application. Of course that will add to the price. 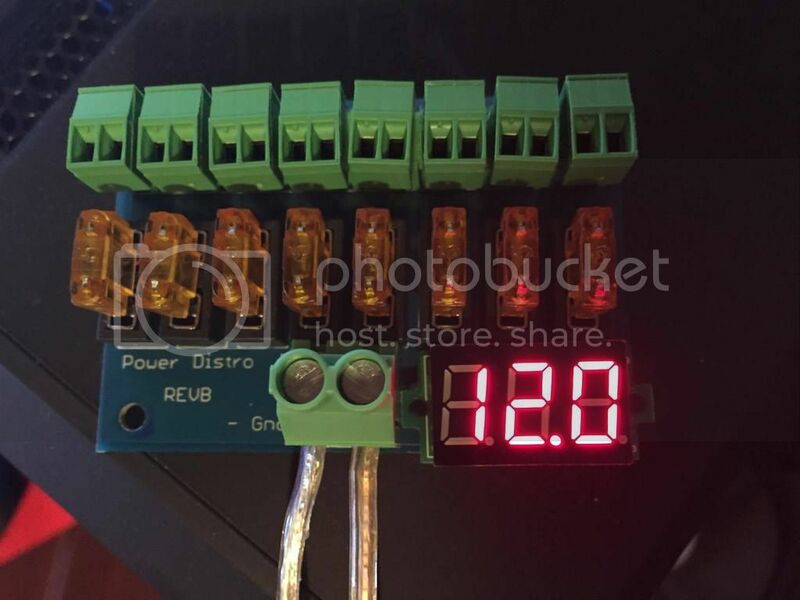 I agree that I would get more use from an ammeter than a volt meter, That said I'd want it visible from outside my enclosure so not really something to integrate into a distro board. 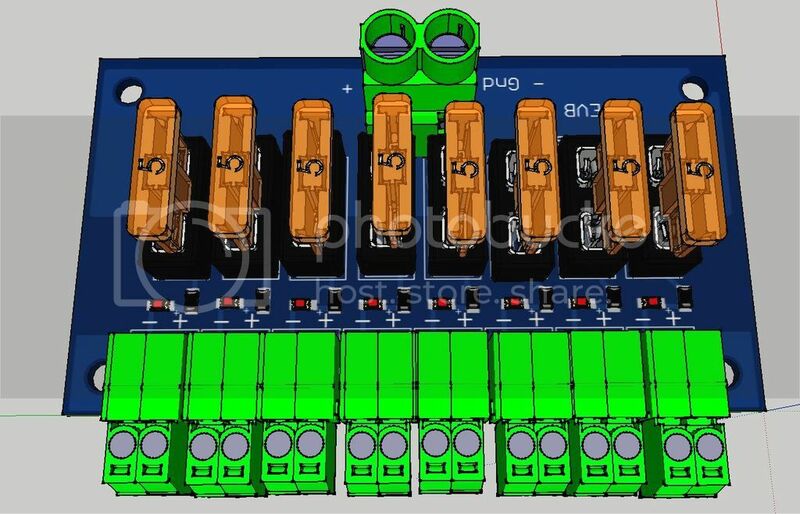 As far as having to derate the inputs for the 8 port model, just use two input connectors each running to 4 outputs. Will increase you amp capacity rather than decrease. My vote is #2 with two input connectors, or just #1 again. I had thought about 2 input connectors but what steered me away from doing that was the cost. Those input connectors are the most expensive component on the board. I also looked at a 40 amp input connector and it was just way to expensive. My goal is to keep these things as low cost as possible. So far what I've heard today is the original design is preferred by most. I'm looking at adding the blown fuse indicators to the original design. It's dirt cheap to add those. I like the original, but with larger output connectors. It can be a challenge to get 18AWG into the first rev versions without it bunching up and having stray threads poking out. While I would love to see an 8-port version of this, I don't see the need for pluggable terminals on such a board. 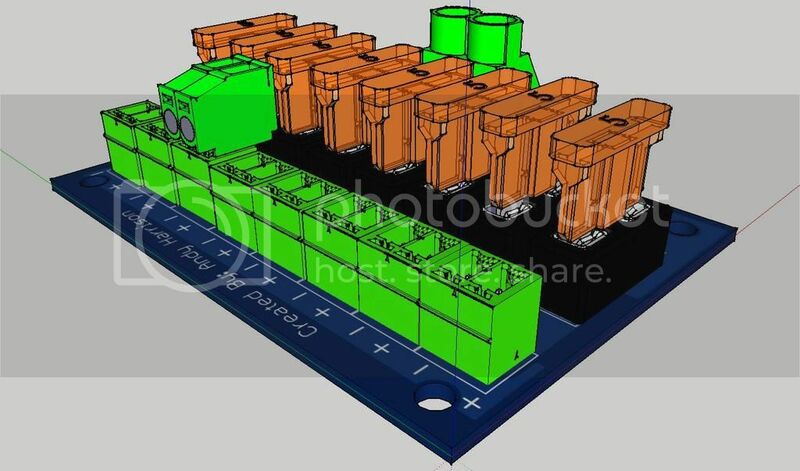 For me, the original 6-port or an 8-port version of it (with or without blown fuse indicators) would be ideal but I will be interested in 10-15 of whatever design comes to fruition!